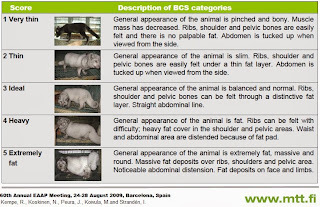 When talking about animal breeding, it is important to understand what it is. Breeding aims at improving the genetics of an animal population with methological breeding systems and programs. Breeding has clear targets, traits to be measured, recorded and followed etc. Breeding is not about increasing the animal population by mating animals to one another, which is what some pet "breeders" do. Fur animal breeding has always aimed at producing pelts which fetch the highest price in the market. Three main qualities affect the price: the size, quality and color of the pelt. Size is measured as the length of the pelt. As a breeding target larger pelts require larger animals, so often the largest and the ones that grow fastest are selected as breeding animals. Large in this context means fat. This however has lead to severe problems with fertility: fat females give birth to small litters. Fur animals breeders must therefore balance between size and litter size to produce enough pelts of an adequate size. The quality of the pelt is a combination of its mass and the coverage of the guard hairs. The ratio between guard hairs and undercoat contributes to the mass of the pelt. In a pelt of good mass the undercoat is thick, strong and elastic, and it supports the guard hairs. In a high quality pelt the guard hairs are longer than the undercoat, there are no color flaws and the length of the hairs is even. The third important quality factor is the color of the pelt. The desirability of different colors varies yearly and depends on fashion trends. Color can be determined by several qualities, such as hue and darkness. The breeding objectives can be divided to three classes, all of which may or may not be used for all fur animal species. The targets are evaluated in a two-step process, first in grading and then as pelt quality factors. Grading is a process where the quality and color of the fur of live animals is manually estimated. Four qualities are estimated: the size, color, purity and quality of the pelt. Grading is done at the fur farm, and may be done several times a year. The size of the pelt is either estimated or measured. Pelt size is measured from the tip of the nose to the beginning of the tail. The purity of the color is also evaluated. For blue foxes the pelt can have four hues ranging from blue to red. The darkness of the color is graded and the mass of the pelt is estimated. The same traits are measured again after skinning in a process called evaluation of the pelt quality. The differences are that pelt quality evaluation is done post-mortem and usually automatically, while grading is done when the fur isn't yet fully developed and is a manual task. The number of classes to which pelts are classified also varies between grading and pelt quality evaluation. For example in grading the pelt quality gets a score from 1-5, while the pelt quality classes depend on the company selling the pelts. There are six traits evaluated as pelt quality: grading qualities (the size, color, purity and quality of the pelt) plus mass and coverage of guard hair. The litter size and result are counted after the pups are three weeks old, because the highest pup mortality is during the first weeks of life. Studies show that young blue fox dams produce larger litters, but the pups have higher mortality than the pups of older females. 2 year old blue fox vixens have the best litter results. Heritabilities are a way of measuring how much genes impact a certain trait, i.e. how well can the trait be developed by animal breeding. Traits with high heritability are easier to develop than traits with very low heritability. Heritability ranges from 0 to 1, where 0 means that genes have nothing to do with the trait, and 1 means that the trait is affected by genes only and there's no environmental impact at all. A Finnish doctor of animal science, Jussi Peura, has calculated heritabilities to several breeding traits for the blue foxes. He found that pelt traits have the highest heritabilities and fertility traits have the lowest. For example, color darkness has a heritability of 0.55 and pelt size 0.30. On the other hand, litter size at 1st parity (1st litter) had a heritability of 0,1, which is fairy low. Peura also studies genetic correlations, i.e. how much traits depend on other traits. For example, in humans height often correlates with weight: the taller, the heavier. For blue foxes there were clear positive genetic correlations between size in grading and size in pelt quality (0,74), color in grading and pelt quality (0,84) and quality in pelt quality and mass in grading (0,75). When a correlation is positive, both traits increase simultaneously. Negative correlations mean that increasing one trait decreases the other. 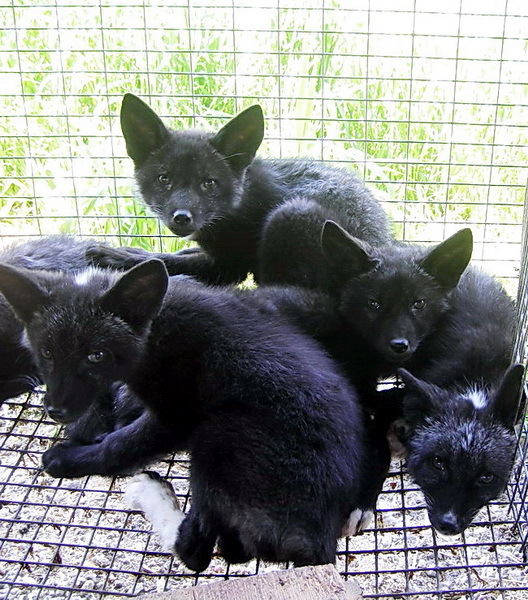 Blue foxes had a significant negative correlation between size and litter size (-0,28). There were mild negative correlations also between size and color purity in grading (-0,25) and color in pelt quality and size in grading (-0,17). What all these mean is that grading gives a reliable estimation of the actual size and quality of the pelt. However, the purity estimation in grading is a poor estimation of the actual purity. The correlations also clearly show that increasing the size of the animals result in poor litter results. The issues and solutions presented in this text are based on WelFur, which is again based on WelfareQuality -protocol. Welfare issues here are classified under the four basic principles of WelfareQuality: good feeding, good housing, good health and appropriate behavior. Animal welfare is a complicated concept with several different definitions and theories. Here animal welfare means the subjective experience the animal has about its own psychological and physiological state as the animal tries to adapt to its surroundings. Welfare cannot then be measured directly. Animal cannot have a welfare of "9.5" or "good" - we can merely measure its behavior and surroundings, and deduce the level of welfare from the findings. As has been previously discussed, obesity is a severe problem for blue foxes. They naturally would eat a lot during fall, and show this behavior also in fur farms. In farms feed is easily available and high in energy, so the animals gain weight very fast, and the size of their pelt increases. Obesity causes their front paws to bend, which again makes mobility very difficult. Healthy paws are rare in any blue fox farm. Fat animals cannot breed well, so the animals kept alive for breeding are nearly starved during the winter. While it would be natural for them to lose weight, in farms the difference between the Fall weight and Spring weight is much greater than in the wild. Normally a blue fox would weigh 3-5 kg - the average weight of farmed blue fox males is a staggering 19 kg, and 10 kg for the females. In any farm where animals are kept in group cages there is no peace during feeding. The animals fight over the food, which causes stress, and fearful animals may be underfed while the more dominating animals are overfed. Another problem common to all fur farms is the availability of fresh, clean water. During winter the water pipes may freeze, and during summer the water may heat and become unsanitary. Problems with availability of water are usually technical in nature: unlike with feeding, there is no reason to purposefully limit the animals' intake of water. Good housing is a wide concept, which consists of a comfortable place to lie, warmth and the easiness of mobility. Small fur animals, like minks and ferrets, must have a nest box available all year round. Foxes have a nest only during whelping. The nest is the only part of the cage with solid floor and walls: otherwise the animals sleep, play and walk on a metal net ( = mesh). The nest box has been proven to increase fearfulness towards humans, because it gives a place for the animals to hide to. That, and the animals' tendency to defecate on solid surfaces, are the main reasons for keeping the nest box available only for a short while. Foxes must also have a shelf in their cage, unless they can lie on top of the nest.The shelf is actually very important for the foxes, who prefer high places from where they can scan their surroundings. The main reason for using mesh flooring is that urine and feces pass through it. Fur animals have a tendency to defecate on a solid surface, which would then need to be cleaned daily to prevent the animals from soiling their fur. While a mesh floor sounds unpleasant, foxes actually prefer mesh over earth floor or solid floor such as wood at least as a resting place. This may be because the mesh allows their fur to stay "puffy" so the animal stays warm. There are no similar studies done on other fur animal species. In order to have and to maintain good health, the animals must have good housing and good feeding. Good health means that the animals have no sicknesses, but also no internal or external injuries or disabilities. In fur farms mortality due to diseases is somewhat low, 3-4 % in foxes between April - October. Treatment of illnesses may be rare. Many animals are kept until skinning even if they are sick, or left to die. Disease epidemics in fur farms are relatively rare. The only exception is plasmasytosis for minks, which occasionally causes significant losses due to sickness and exterminations. The most common diseases vary between animal species. For foxes and minks infections of the womb and gut are the most common illnesses. Eye and skin infections, urinary tract infections and diarrhea are sometimes seen in foxes. Diarrhea can also infect minks, but rarely raccoon dogs, who are capable of eating even partially rotten meat without trouble. As has been noted before, bent front paws and obesity are extremely common health risks in blue foxes. They are not usually life-threatening or even painful in fur farm conditions, but most likely they do decrease the animal's welfare. 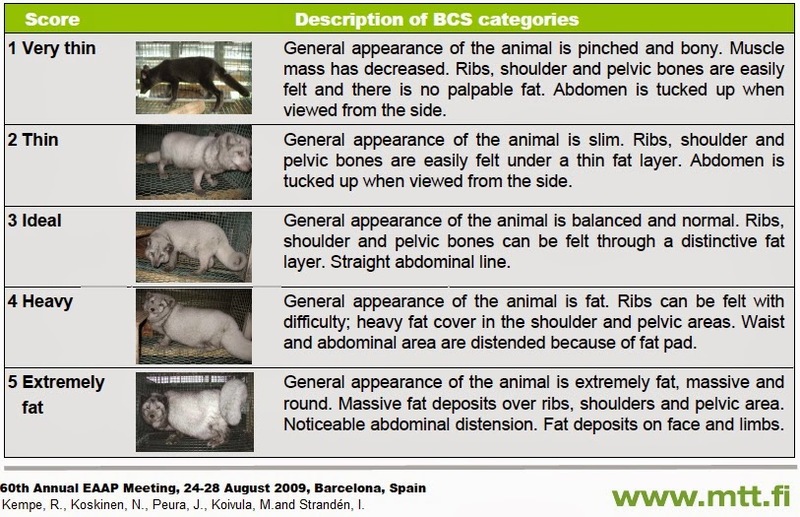 Compared to most farm animals (cows, pigs etc.) fur animals receive no painful treatments. For example, there are no surgical castrations, tooth cutting or cutting of the ears, which are all performed on piglets. Still, care must be taken to ensure that all fur animals are killed humanely and quickly before skinning. The killing and skinning must be done far away from the live animals to prevent fear and panic. Expressing normal and appropriate behavior is mostly impossible in fur farms. Pups can be weaned at the "correct" age, but they cannot spread apart like they would do in the wild. Animals are not allowed a space for their own. They also do not need to hunt or forage, which in the wild would occupy most of their time. Silver foxes would normally live in small groups, where only the dominant female would raise a litter, and the females of lower rank would kill their own pups if they have any. To keep thousands of females in adjacent cages, all with their own litter, may cause stress and increase situations where females kill their pups. Group vs single housing is an important question for all fur animals, but many study results are contradictory. Group housed minks can fight more and therefore damage the pelts. Their stress levels may also be elevated if the group is not balanced. On the other hand, group housed minks have company, can play with one another, and in a balanced group are also less stressed than individually housed animals.